If you’ve heard of autism, you’ve probably heard of Autism Speaks. For those who haven’t, they’re a USA-based “charity” (scare quotes entirely justified), and one of the biggest voices out there when it comes to talking about autism. Autism Speaks is not a very nice company. First, there’s the fact that all of the positions of power in the organisation are held by non-autistic people. This is about as appropriate as a bunch of white people making decisions for a charity claiming to be for the aid of people of colour, or a charity composed entirely of men discussing women’s rights. They had an autistic advisory board member once. He resigned as a result of Autism Speaks’s attitude towards autistic people. They’re too far removed from the reality faced by Autistic people. The fact is, though, that they don’t really cater for autistic people, they cater for parents of autistic people. Next up are their business practices. While their last available year (2012) oncharitynavigator indicates that the majority of their expenditure is in “Program expenses”, the breakdown of what this actually means is less favourable to Autistic people. Here’s their 2013 financial statement. Let’s talk about their research first. Autism Speaks makes no secret of the fact that they’re searching for a cure for autism. Most autistic adults, and their old board member referenced above, however, will tell you that while some aspects of autism are inconvenient and even disabling, we don’t want that part of us “cured”. Autism is part of what makes us who we are, and the idea that unconsenting children might be “cured” simply for the convenience of their parents is abhorrent to many of us. That’s assuming that autism can be cured, though. The majority of reputable research indicates that autism is genetic, caused by either inherited genes or by new mutations that happen in gametes or newly forming embryos. What does this mean for an autism “cure”? Well, it means it won’t be a cure, it’ll be prevention in the form of prenatal testing and encouraging parents to terminate pregnancies that might result in autistic children. I’m pretty pro-choice, if you don’t want a baby, don’t have one, but I take a huge issue with encouraging the termination of intendedpregnancies on the grounds that you’ll get someone with a neurotype you didn’t want. Wiping out a group of people by stopping them from being born is called genocide. The terrifying thing here is that Google has teamed up with them to help them crunch the data from their genomics research. We’re petitioning Google to reconsider this alliance, but it may well be time for me to switch search engines, phones, and backup services. So there’s the whole eugenics angle that Autism Speaks works from. Next up on their expenses, and the thing they spend most of their money on, is “Awareness and other services”. Autism Speaks does a lot of “raising awareness”. Sad to say, awareness is not helpful to us. Awareness comes with stigma and stereotypes and makes our everyday lives harder. Awareness makes it easier for us to be singled out by people who will do us harm. Lei Wiley-Mydske, an autistic parent of an autistic child, has written about how Autism Awareness has made it harder for her to advocate for the needs of her child. Autism Awareness invites discrimination. What the Autistic community wants most is Autism Acceptance, respecting Autistic people as the authority on their own needs. Autism Speaks are also not very nice when it comes to their portrayal of Autistic people in their awareness campaigns. You can check out Suzanne Wright’s Call for Action, where we’re compared to missing children or the gravely ill. We’re said to have “lost touch”, be the cause of financial troubles and family breakdowns. We’re fed a narrative of parents never getting any sleep, of living in fear of what their child will do next, of not really living, just existing. Notice this is all about the poor parents looking after their difficult children. There’s nothing there about the experiences of the child, the difficulties they face as a result of their autism. We’re described as a “monumental health crisis”, when many of us are perfectly healthy. Then it’s all about the cures, the therapies, making progress. Autism Speaks are very much pro-ABA, which many Autistic people describe as the equivalent of gay conversion therapy. There’s a brief bit about our differing educational needs. Then straight into how much we cost to keep. Then there’s the assumption that every single one of that scary 3 million children will grow up to have co-morbid conditions preventing them from managing their own care. There’s no respect for Autistic people in this writing, just scare tactics and dehumanizing rhetoric. That’s without mentioning their infamous video “I am Autism“, in which an evil-sounding voice narrates “I am Autism, and I’ll make sure your marriage fails”, amongst other hideous assertions that autism will destroy your family, take all your money and cause you embarrassment at every social event. It’s compared to a number of diseases, including AIDS and Leukemia, diseases that kill people, rather than what autism is, a (sometimes disabling) difference in neurology. It’s again blamed for leaving families penniless, breaking up marriages, depriving parents of sleep. The proud families finally rally together against their children’s brains, declaring that they will beat autism. Not satisfied with that, they also produced Autism Ever Day, a documentary specifically shot to show the darkest possible side of living with a child on the spectrum. The most worrying aspect (other than the general air of doom and gloom about the condition), was this clip. A mother describes wanting to drive off a bridge with her autistic child, and only choosing not to do so because she also has a neurotypical child. As if expressing that sentiment isn’t enough, she says it while her (presumably autistic) child is playing behind her. As many nonspeaking Autistic people have written in various blogs, being nonverbal does not have any bearing on whether a person can hear and understand what is being said to or about them. Even not being able to respond in a way that other people can understand doesn’t exclude the possibility (even probability), that a person can understand what’s going on around them. In all likelihood, this child just heard and probably understood her mother say that she would have killed both of them if it wasn’t for a normal sibling. How much must that hurt? So that’s where their advertising budget goes. Blaming, stigmatising and dehumanising the people they claim to serve. It’s estimated that only about 4% of Autism Speaks’s massive income is actually spent on supporting autism families, and less than 1% of that is spent on Autistic adults. There is also, of course, the matter of Autism Speaks and their alliance with the Judge Rotenberg Center. So if so much money is going into things that actively harm us, and so little is going into things that could potentially help us, can we really say that Autism Speaks is a charity for people with autism? Absolutely not! There are plenty more reasons that Autism Speaks can hardly be called a charity for autistic people. 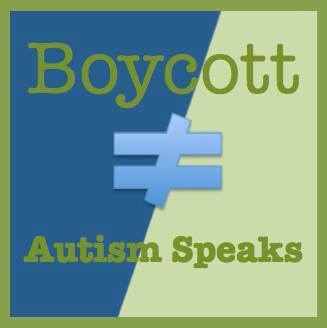 If you need more examples, check out the #BoycottAutismSpeaks twitter hashtag. If you have an argument along the lines of “But what about severely autistic people?”, check out my post But What About… and perhaps read some of Amy Sequenzia’s posts. You can also reach out individually to Autism Speaks sponsors and ask them to end their support for what many Autistic people regard as a hate group.